January 15, 2019 2019: LESS THAN 3 INCREASES? 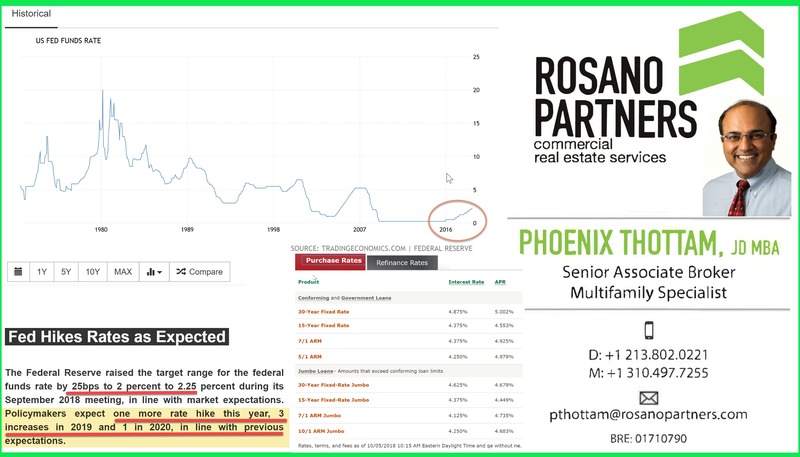 Mixed but generally more dovish signals from Fed on Interest Rate Hikes Multifamily & Retail Real Estate Investors would be wise to note that U.S. 10-year Treasury yields have increased — after a slight dip — from 2.56 percent two weeks ago to settle at a range of approximately 2.74 percent. Fed Chairman Powell and the #2 at the Fed have made verbal comments indicating there may not be a three step interest rate increase this year which is providing a slight ease in interest rate concerns. The key word, however, is might. Powell has also emphasized his concerns regarding the excessive debt at individual, state, corporate and national levels in the U.S. and has emphasized both the plans and need for the Fed to shrink its now gargantuan balance sheet. The Federal Reserve controls short-term interest rates. The Fed is is currently in the midst of a hiking cycle that began at 0.25% in December 2008. The S&P 500 actually bottomed three months later, in March 2009, shortly after President Obama first took office. Short-term rates have slowly risen since then, by another 50 bps to 0.75% in late 2016, by an additional 75 bps to 1.50% in 2017, and by another 75 bps to 2.25% thus far in 2018. Federal fund futures, financial contracts that represent market opinion of where the official federal funds rate will be at at various points in the future, are currently pricing in an 80% chance of an additional 25 bps hike to 2.50% at the December 19th Federal Open Market Committee (FOMC) Meeting. The current federal funds rate rose to 2.25 percent when the Federal Open Market Committee met on September 26, 2018. This benchmark rate is an indicator of the economy’s health. The Federal Reserve has clearly signaled it would raise rates to 2.5 percent with one more forthcoming increase in December 2018 (4 increases total in 2018), 3.0 percent in 2019, and 3.5 percent in 2020. Powell/The Fed has also clearly indicated it plans three additional increases for 2019, one more increase in 2020, add about a half a hike in 2021 as part of a possible new forecast—ultimately bringing the Fed funds rate from the current October 2018 level of 2.25 to 3.50 percent. The market controls long-term interest rates. The 10-Year Treasury Note is the most widely tracked government debt instrument in finance, and its yield is often used as a benchmark for other interest rates including corporate bonds, agency bonds (Ginnie Mae, Fannie Mae, Freddie Mac), and mortgage rates. Chart 1 below, a monthly chart, shows that the 10-year bottomed near 1.50% twice – at 1.51% in July 2012 and at 1.46% in July 2016, and is currently at 3.07%. The only other time U.S. 10-year yields were as low as 1.50% over the past 100 years was in November 1945, at the end of World War II. The Bureau of Labor Statistics (BLS) released its monthly Employment Situation Report today, which shows continued evidence of a strong labor market. The U.S. unemployment rate is now the lowest it has been in nearly 50 years, payroll employment continued its historic streak of positive jobs gains, and average weekly wages continued to rise. BLS’s September survey of households offers evidence of a booming United States economy. The unemployment rate dropped 0.2 percentage points (p.p.) over the month to 3.7 percent, the lowest it has been since December 1969 (see figure below). This is only the tenth month since 1970 that the unemployment rate has been recorded below 4 percent, with five of these months occurring in 2018. We know this decrease in the unemployment rate is due to more people finding jobs, as the labor force participation rate remained unchanged in September. In addition to the nearly 50-year low for the overall unemployment rate, unemployment also reached historic lows for multiple demographic groups. The unemployment rate for Hispanics fell to 4.5 percent (matching July 2018), the lowest rate ever recorded. For women, the unemployment rate fell to 3.6 percent (matching May 2018), which was the lowest rate in nearly 65 years. The unemployment rate for those with a high school degree and no college attendance hit 3.7 percent, the lowest since April 2001. Furthermore, September was the first month since December 2000 that the number of people who are unemployed fell below 6 million. The BLS survey of employers, also released today, showed that nonfarm payroll employment rose by 134,000 jobs in September. While below expectations for the month of September, employment gains in August were upwardly revised by 69,000 jobs, now showing 270,000 jobs gained that month—a very healthy number. Including the upward revisions in both July and August, average job growth per month is 208,000 for 2018, exceeding the average monthly gains in 2016 (195,000) and 2017 (182,000). Since President Trump was elected in November 2016, the strong United States economy has created 4.2 million jobs. Job growth has been strong across the board during the first 20 months of this Administration. Since the President took office, goods-producing industries (construction, manufacturing, and mining and logging) have added almost 900,000 jobs. Of the 14 sectors measured, only retail trade, leisure and hospitality, and other services experienced job losses in September, and the employment decline in leisure and hospitality employment (-17,000) can likely be partially attributed to the effects of Hurricane Florence. Nominal average hourly earnings rose by 2.8 percent over the past 12 months, while nominal weekly earnings growth was even stronger at 3.4 percent over the past 12 months. This is the fifth consecutive month with nominal 12-month growth over 3 percent—the longest streak with 3 percent nominal weekly earnings growth since 2010. Real wages (which take inflation into account) are also growing. Based on the most recent Personal Consumption Expenditures (PCE) price index data from August, inflation in the past year was 2.2 percent (September data will be available later this month). The current federal funds rate rose to 2.25 percent when the Federal Open Market Committee met on September 26, 2018. This benchmark rate is an indicator of the economy’s health. The Federal Reserve signaled it would raise rates to 2.5 percent in December 2018, 3.0 percent in 2019, and 3.5 percent in 2020. The rate is critical in determining the U.S. economic outlook. The 2008 recession caused the Fed to lower its benchmark rate to 0.25 percent. That’s effectively zero. It stayed there seven years until December 2015, when the Fed raised interest rates to 0.5 percent. The fed funds rate controls short-term interest rates. These include banks’ prime rate, most adjustable-rate and interest-only loans, and credit card rates. The FOMC raised the fed funds rate a quarter point to 2.25 percent on September 26, 2018. 0.5 percent on Dec. 15, 2015. 0.75 percent on Dec. 14, 2016. 1.0 percent on March 5, 2017. 1.25 percent on June 14, 2017. 1.5 percent on Dec. 13, 2017. 1.75 percent on March 21, 2018. 2.0 percent on June 13, 2018. The Fed finished tapering off its quantitative easing program in 2013. That was a massive expansion of the Fed’s open market operations tool. The Fed still had $4 trillion of debt in 2017 on its books from QE. In October 2017, it began allowing its holdings to gradually decline. The Fed’s higher rates affect your savings, your purchases and your loans. Learn about five things you can do right now to protect your finances. The FOMC sets a target for the fed funds rate at its regular meeting. Banks charge each other this rate when they lend each other funds. Those are loans banks make to each other to meet the Fed’s reserve requirement. Technically, the banks set these rates, not the Federal Reserve. But banks usually follow whatever rate the Fed sets as its target. The FOMC targets a specific level for the fed funds rate. This rate directly influences other short-term interest rates such as deposits, bank loans, credit card interest rates, and adjustable-rate mortgages. By lowering the fed funds rate so dramatically during​ the 2008 financial crisis, the Fed kept funds available for banks. It signaled to financial markets that the Fed would act decisively to keep banks functioning. The fed funds rate is the most significant leading economic indicator in the world. Its importance is psychological as well as financial. In fact, the only two rates it directly impacts are the prime lending rate and adjustable rate mortgages. The yield on the 10-year Treasury note determines conventional mortgage rates. Find out how the two work in controlling recession and inflation. Sep. 18, 2007: A 1/2 point cut to 4.75 percent. Oct. 31, 2007: A 1/4 point cut to 4.5 percent. Dec. 11, 2007: A 1/4 point cut to 4.25 percent. Jan. 22, 2008: A 3/4 point cut to 3.5 percent. Jan. 30, 2008: A 1/2 point cut to 3 percent. March 18, 2008: A 3/4 point cut to 2.25 percent. April 30, 2008: A 1/4 point cut to 2 percent. Oct. 8, 2008: A 1/2 point cut to 1.5 percent. Oct. 29, 2008: A 1/2 point cut to 1 percent. The Fed’s aggressive expansionary monetary policy was needed to address the 2008 financial crisis. In August 2007, banks became fearful of loaning each other funds, causing the Libor rate to rise. The Fed initially tried to calm this panic by adding funds to the discount window, hoping that this would restore liquidity and confidence in financial markets. When that didn’t work, the Fed realized it needed to lower the fed funds rate. By 2008, the Fed bailed out Bear Stearns, bought AIG, and made nearly unlimited funds available to banks to prevent global financial market collapse. After the Fed bailed out Bear Stearns, it thought the crisis was over. In April 2008, the Libor started to diverge from the fed funds rate. The Fed lowered the fed funds rate, but LIBOR continued to rise. Despite the Fed’s reassurance, banks continued to panic, and were unwilling to lend to each other. They were afraid of receiving subprime mortgages as collateral. By October 2008, the fed funds rate was 1.5 percent, but Libor was 4.3 percent. Many people worried that the Fed’s stimulus programs would create inflation. But it didn’t, because the Fed wound down most of the programs that steered the world’s largest economy away from collapse. It also outlined a plan to absorb money the Fed has pumped into banks since August 2007. Instead, the Fed’s policies created asset bubbles in commodities not measured in the Consumer Price Index. Those include bonds, gold, stocks, and the dollar.